I love fall! It’s probably my favorite time of year. The smells of outdoor campfires, apples, pumpkin and spice, leaves crunching beneath your feet, the roar of the crowd at a football game, and the beautiful colors of the leaves changing here in the northeast – it’s a feast for the senses! 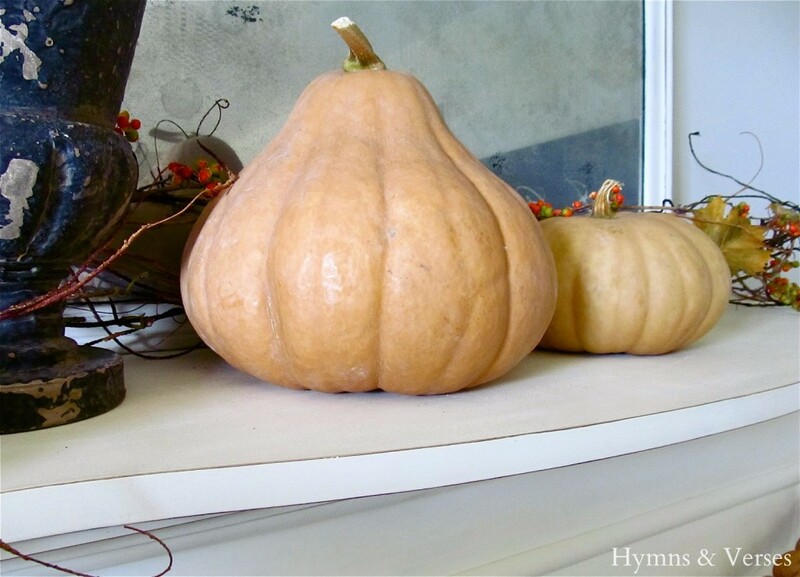 Today, I’m going to share my mantel all decked out for fall! I kept my Anthropologie-inspired lace mirror in place. To see how I made it, click HERE. I added some twigs to the rustic vase and placed some grapevine and bittersweet across the top of the mantel. I found a faux spray of fall maple leaves that looked more natural and used glue dots to attach the individual leaves to the twigs and grapevine. I found these two pumpkins at a local farm stand – I loved the pale color and shapes and thought they would look nice with the color of the walnuts. Growing up on the farm, we had a huge walnut tree that dropped what seemed like thousands of walnuts each year! I’ve used walnuts over the years to decorate – last year I used gilded silver walnuts on my Christmas tree. You can see them HERE. For the walnut garland, I used the largest and longest needle I had and threaded it with thin twine. I got out my cutting board so I wouldn’t damage the surface I was working on. I got the needle started at the top of the walnut and used a small tack hammer to gently hammer the needle through to the other side of the walnut and then pulled the needle through with needle nosed pliers. It took about an hour, but I watched something on TV so it didn’t seem so tedious! I made two strands, one slightly longer than the other and attached them to the front of my mantel. I have two small screw in hooks on either side of my mantel for hanging garlands and, of course, Christmas stockings. Once the twine was tied to the hooks, I ripped a one inch piece of cotton fabric and tied those pieces to the hooks as well. The mantel is pretty simple, but that’s my mood this year! Today I’m headed out to the market to pick up some things to decorate outside – pumpkins, straw bales, and maybe even some cornshalks! Thanks for stopping by! Your mantel is absolutely gorgeous! I love how simple it is and the pretty light colors. Pinning and going to try the walnut garland. I had attempted one last year and it was pretty much a disaster. Thanks for sharing your tips! Your mantel is simply elegant. I love it! Very pretty! Love the simplicity and natural vibe! I follow you on Pinterest and saw your pin. I love this. I would love to make something similar using walnuts with something else natural like pinecones or mix in something totally unnatural like some fabric cut leaves. Yours is beautiful! So pretty! Love the walnut garland! What a cool idea. I love your wall color too. It's gray, right? 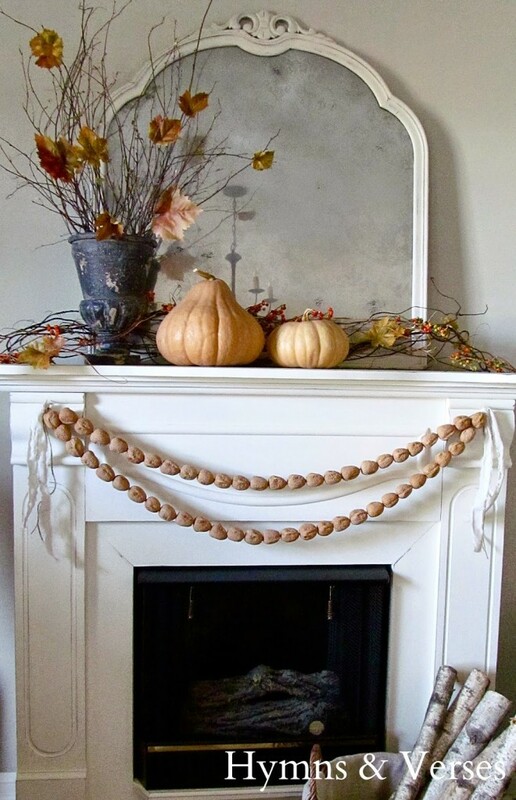 Love the walnut garland…your mantel looks beautiful!! Pretty fall mantel. Love the walnut garland. 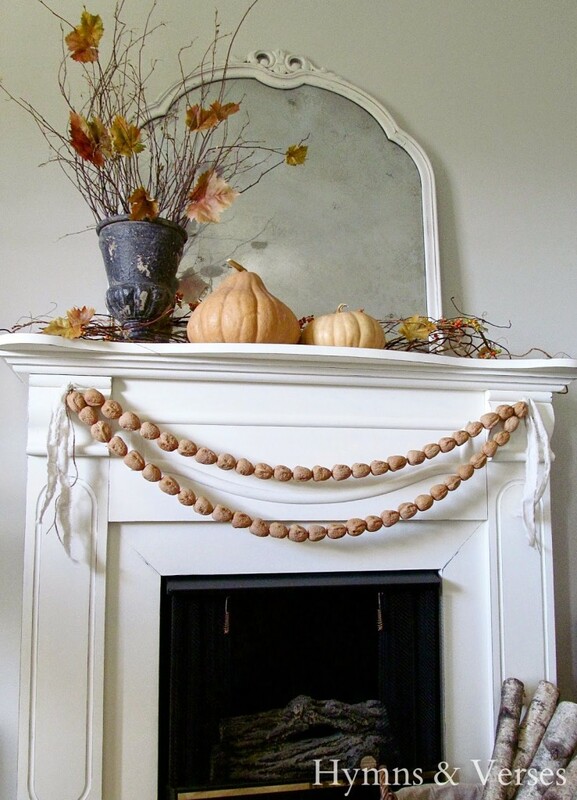 I love the simplicity of the walnut garland! Your entire mantel is beautiful. I too love the color and shape of the pumpkins. 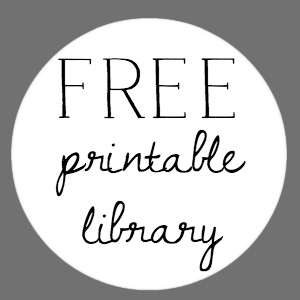 I would love if you linked this to my party, Share Your Cup Thursday. It's all about sharing what makes you happy. 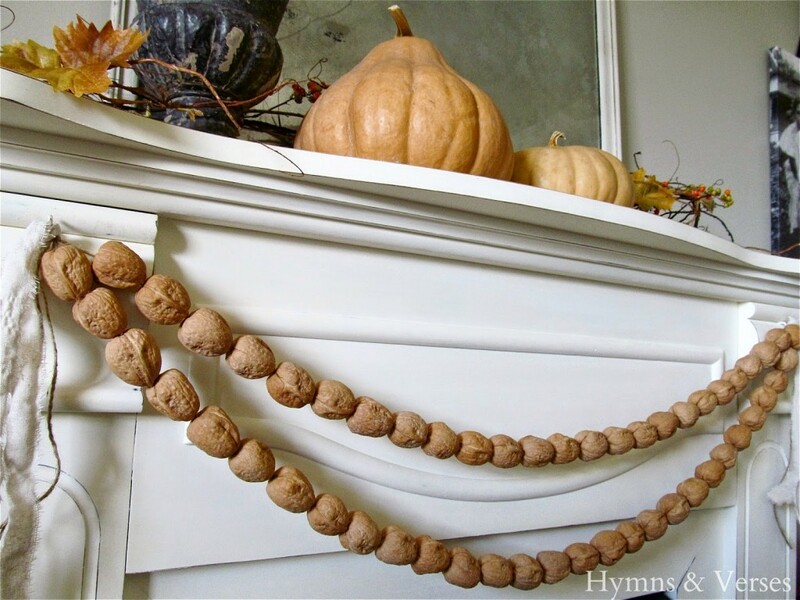 Love the walnut garland–I am sharing it on my facebook page. Really pretty! I just love the way you decorate with natural elements! Beautiful mantle – love all the natural elements – given me great ideas for my mantle! Love the simplicity of the walnut wreath. The mirror is wonderful. Oh how I love the walnut garland. It looks beautiful along with your autumnal vignette! Gorgeous mantle and I do love your walnut garland, such a nice touch! 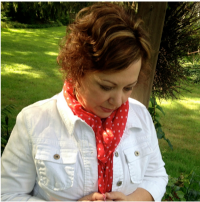 So happy to know you and thrilled you've shared at AMAZE ME MONDAY! I just love this whole look! It captures Fall so elegantly! The walnut strings are just beautiful! Your Fall mantel is simply lovely. I can see how this will last all season long and it has a lot of potential for Christmas, as well. Take away the pumpkins and fall leaves and the walnut garland and urn could be accompanied by some greenery and festive colors and be just about perfect for the yuletide season. Great decorating! I totally love your walnut garland. Unfortunately, I don't have the patience to make one. I did, however, make a few hand cut oak leaves out of book pages. They look pretty nice, and much more my speed. Oh my, I love that walnut garland! Everything is just beautiful! How pretty and restful! I adore the walnut garland! Doreen, this is so elegant. I just cannot stop looking at it. I am so glad you shared this at my party last week. Your mantel is decorated beautifully…I too love the walnut garland. Simply elegant!! Beautiful. I love the walnuts! Your mantel is stunning and is probably my favorite of all that I've seen so far. Definitely worthy of Apartment Therapy!! The walnut garland is so creative! Your mantle looks lovely. 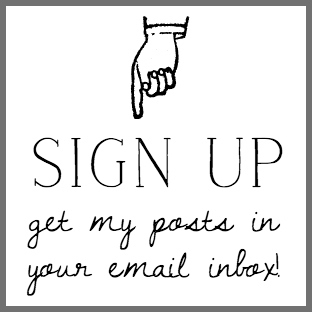 I invite you to share at my Thursday blog hop. Hugs!